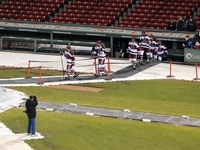 Senior Eric Kroshus ended up on the ice during the Harvard men's hockey team's 2-0 loss to Union Friday night at Fenway Park. BOSTON—After nearly two periods of back-and-forth, scoreless play on the ice at Fenway Park, it looked like the Harvard men’s hockey team (4-5-6, 3-4-4 ECAC) and No. 13/14 Union (11-5-6, 5-2-3) were headed toward the same result as when the squads met last Friday: a draw. But with just four seconds to play in the second frame of Friday night’s rematch, the Dutchmen’s Mat Bodie netted a momentum-changing goal on a brief power-play opportunity to help Union claim a 2-0 victory over the Crimson. At 17:33 in the second period, Harvard had earned its second man advantage of the game, as a slashing violation landed Union sophomore Daniel Carr in the penalty box. But the Crimson power play was short-lived. Just 44 seconds later, freshman defenseman Patrick McNally followed suit and was sent off the ice for tripping, leveling the playing field to four skaters apiece as the second frame neared its close. With 27 seconds left in the period, Carr came back onto the ice and the Dutchmen were able to capitalize on the ensuing scramble. After nicking Harvard captain Ryan Grimshaw’s skate, the puck found its way to Bodie’s stick, and the sophomore converted the game-winner on a one-time shot. Kelly Zajac and Shayne Gostisbehere were credited with assists on the play. Union stretched its lead to two in the opening minutes of the final frame, as Zajac earned a tally of his own from close range at 5:37 with help from teammates Wayne Simpson and Nolan Julseth-White. Although the Dutchmen shut the Crimson down in the third period, limiting Harvard to just two shot attempts, the Crimson was not without its chances early on. At 3:34 in the second frame, assistant captain Daniel Moriarty worked the puck around the back of the Union goal and slotted it across to classmate and fellow forward Peter Starrett. Starrett came across the net from the left side and placed the puck past Union goaltender Troy Grosenick. The tally registered on the Fenway scoreboard, but the go-ahead goal was called back after the referees determined the net had moved out of position before the score. The Crimson started off the contest with momentum, outshooting Union, 8-1, in the first few minutes of play. But in the third period it was all Union. 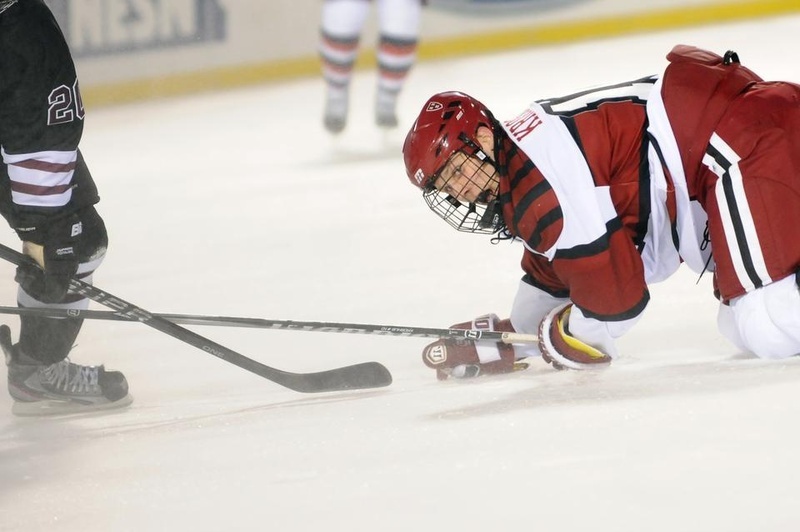 Harvard pulled freshman goaltender Steve Michalek in a last-ditch attempt to put points on the board, but it was to no avail, as the Dutchmen sealed the 2-0 shutout. Despite the loss, which drops the Crimson below .500 in ECAC play, Grimshaw remained positive about Harvard’s overall experience in the team’s first ever hockey game at historic Fenway Park. “Obviously it would have been better to get the win, but … we’ll definitely remember it,” Grimshaw said.